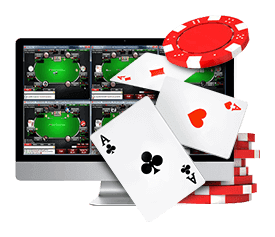 Success in a multi-table tournament demands that you are a master of several different playing styles. 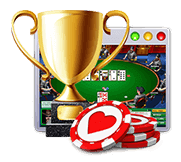 Constantly growing blinds and a continually dwindling field require the application of different strategies as you progress through the tournament. Blinds are low and effective stack sizes are huge early on in the tournament. Keeping the pots small allows you to expand your range and see more flops. A tournament with a starting stack of 5,000 and an initial big blind of 20 gives each player 250 big blinds. This gives you quite a bit of wiggle room to play a few more speculative hands, as long as you keep the pots relatively small. There's no reason to risk half your stack chasing a flush in the first blind level. The opening levels are also a good time to get a feel for how your tablemates are playing. Try to determine who the strong players are (i.e. the ones you want to avoid getting into hands with) and who the weak players are. 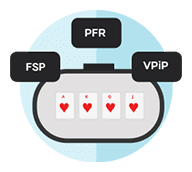 If you're using a HUD, pay attention to a player's VPIP statistic (voluntarily puts into pot), his pre-flop raise, and flops seen percentages. Keep in mind that they may be a little higher than normal because of the larger effective stack sizes. A tournament is a marathon, not a sprint. You can't win a multi-table tournament in the first few levels, but you sure can lose it. A good goal for the first hour of a multi-table tournament is to have doubled your starting stack. When the middle stage of a tourney hits (when the big blind gets to 100), effective stack sizes have been reduced considerably. Most players now have less than 60 BBs, and many are down in short stack territory (30 BBs or less). This is the time to tighten up a bit. At this juncture you want to avoid multi-way pots. A 9-4 offsuit and a five-way pot is a terrible combination, no matter how good the pot odds are. It's time to start treating your chips like a precious commodity. This is also the time to really start paying attention to position. You can't afford to throw away chips pre-flop anymore. Fold all but monsters in early and middle positions, especially if you have a known aggressive players behind you. Always ask yourself, what am I going to do if I get re-raised? If the answer is fold, then do yourself a favor and fold before you put any chips into the pot. No reason to take a chance that your bet will make it through. To paraphrase Ben Franklin, a chip saved is the same as a chip earned. By the time the bubble stage hits, you want to have achieved your second double up. When the field starts to get close to the bubble, it's time to really pay attention to your stack size. If you are under 20 BBs, tighten up and stop limping, bluffing or blind stealing. You're looking to play premium hands that can pay off big so you can build your stack back up. The last thing you need to do is start frittering away chunks of what's left of your stack chasing flushes or straights, or making bad bluffs. If you are significantly above the chip average, it's a good time to turn up the pressure. Play the role of table bully and take advantage of the short-stack players who are hoping to get into the money for the min-cash and will fold almost everything. Your objective is to make a deep run, not just get into the money, and now is a good time to build on your already impressive stack. Play slows considerably at this stage. No one wants to be the bubble boy or girl, so patience is a key until the bubble bursts. Immediately after the bubble bursts, the small stacks are itching to shove, and their range widens considerably. They'll play any ace, any suited connectors, any pocket pair. If you have a big stack and can afford the risk, take advantage of these players' desperation, especially if you can isolate the small stack. After the bubble bursts, you may lose 10-15 players in the next 10 minutes, but once it gets down to the final handful of tables, the rate slows considerably. Position is critical at this stage, and blind stealing and blind defense take on more importance. The ability to steal blinds and defend your blinds can help keep you afloat long enough to wait for that monster hand to deliver that huge double up you need. This is when table image is key. Loose, aggressive players will almost always defend their blinds, and are also more apt to try to steal blinds. As a result, you would be better off not trying to steal their blinds but being more aggressive when defending your blinds against them. At this stage of the tournament, most hands are decided pre-flop. One pot can shoot you up the leaderboard, and one mistake can signal the end. Once play reaches the final two tables, pay jumps are much more significant and frequent. For nine-handed tournaments at most sites, pay jumps increase every nine spots (i.e. every time a table is closed) until you get to the final 18 players. The pay jumps increase every three spots (i.e. 18-16, 15-13, and 12-10) until you get to the final table, when the pay jumps with every elimination. For larger fields, the more rapid pay jumps may start at the final 27 or 36 players. The most critical skill in this stage is patience, as play becomes very tight. It may take 1-2 hours to play down the final two tables, so be prepared for a long haul. You've also got to be mentally prepared to handle huge chip swings. If you lose half your stack when your opponent hits a flush on the river, shake it off quickly and stay focused. This is not the time to go on tilt. Making it to the final table is a tremendous accomplishment, and one that should not be taken for granted. When you get those rare opportunities for a big pay day, you need to do everything you can to maximize your achievement. Visit the Strategy Section for more articles like this!